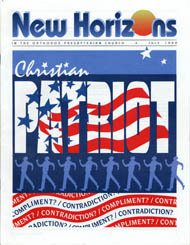 Christian Patriot: Contradiction or Compliment? A few months ago, I visited, for the first time, the Prisoner of War (POW) National Memorial at Andersonville, Georgia, about 150 miles south of Atlanta. Having served in the Navy as a pilot for almost twenty-five years, and having known some POWs from the Vietnam War, I was quite moved by the museum, video interviews of living POWs, and the overall setting. Evangelical book catalogs promote books such as Planet Earth: The Final Chapter, The Great Escape, and Left Behind. Bumper stickers warn us that the vehicle's occupants may disappear at any moment. There is clearly a preoccupation with the idea of a secret Rapture. American consumers today face a dazzling and dizzying array of choices. Companies are constantly creating new products. Giant chains are building huge stores all across the landscape. Video stores provide thousands of movies for home viewing, competing with the 500-station cable networks.